In terms of tech droughts it would be fair to say that the past month has certainly been through one. Thanks to customs regulations in Russia there were little new parts three weeks ago and the teams had to compensate in Japan. Thankfully after a healthy break and more relaxed laws over goods, the US GP was a perfect opportunity to bring developments. Some teams even brought 2015 prototype components for evaluation. The Circuit of The Americas is an ideal proving ground for such parts as the track tests aerodynamic performance to quite an extreme: high speed corners and long straights force teams to cut drag whilst retaining a high level of downforce. Lotus were the talk of the paddock last weekend as the team trialed a 2015-style nose, albeit not quite 2015 specification due to the limitations of this year’s regulations. Whilst many expected a nose shape similar to the Mercedes – as this would still be legal next year – the prototype drew many comparisons to the Ferrari nose, featuring a very low nose tip hanging right above the front wing main plane. As you can see, the nose tip is suspended above the back of the neutral section of the wing by the two attaching pillars, which arch back to meet the nose. For 2015, the regulations state that the nose must be 50mm further forward over the wing from this year, so Lotus have decided to keep their cards close to the chest. If you haven’t already seen, please read my 2015 nose regulation analysis piece! 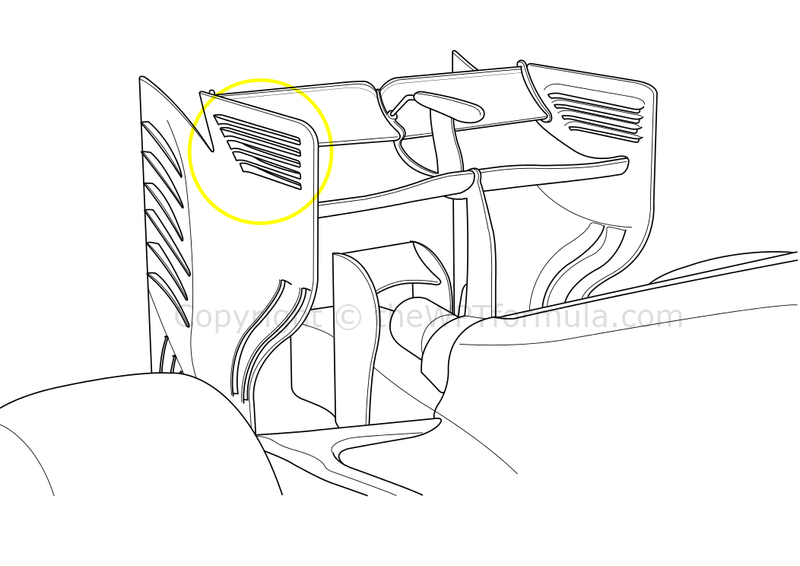 The 2014 regulations dictate a larger cross sectional area at the front of the nose and Lotus have conformed to this by producing a large, stubbed tip. For 2015 the cross section becomes small and a uniform taper must occur, both upwards and in width, up to the front bulkhead. It is because of this nose tip design that we know that the prototype is, quite literally, a prototype. The nose does however conform to the three-stage taper up to the front bulkhead, which is defined in next year’s regulations. Like most teams this year the chassis is stepped where it forms the front bulkhead and a vanity panel is used to conceal the gradient change, hence producing a very steep profile. 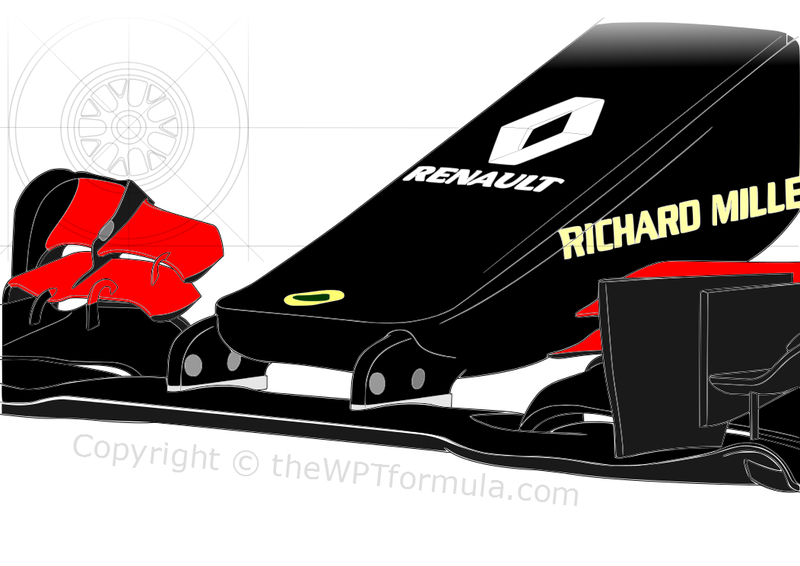 The bottom of the nose is convex in shape, which follows on from the recent philosophy of producing a ‘pelican chin’ to aid airflow beneath the chassis and onto the splitter region. There is some relative freedom regarding the shape of the bottom of the nose for next year so it is interesting to see that Lotus have opted to stick with what they know is a proven concept for now. Overall though, it was a test item aimed at looking at the aerostructures at the front of the car going into next year. There are plenty of opinions about how critical nose design is but, in my opinion, it is very important. Lotus have gone from a radical, asymmetric twin tusk design to a more conventional shape so they are bound to have seen some huge changes to the airflow as it passed downstream. They will gather this data and optimise the rest of next year’s car around a similar shape. 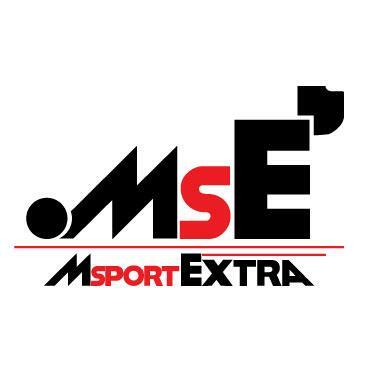 Whether they will test it again before the end of the season is unknown but I would imagine we could see it return at the post-season test in Abu Dhabi. Ferrari had a busy weekend in America as they continued to evaluate aero structures around the front of the car for 2015. Kimi Raikkonen’s car had a huge aero sensor pod installed to the side of the cockpit that took measurements of the airflow spilling off the front tyre/front suspension assembly. Both drivers also did back-to-back tests of various components including a new rear wing. The endplates have been extensively modified and take design cues from Red Bull’s early season endplates due to power unit problems. Two new slots (circled) allow air to pass beneath the wing into the low pressure zone created. This seems counter-intuitive considering that the whole idea of a wing is to produce as much downforce as possible. However the slots will disperse the low pressure at a high speed threshold moreso than they do during a high speed corner. We could be talking 190mph+, as this wouldn’t affect cornering performance. These slots have been coupled to a new set of endplate louvres directly above, which work in conjunction with the aforementioned items to further reduce the size of the wingtip vortices formed as the upper and lower pressure areas meet. This further reduces drag whilst enabling the team to run a slightly higher angle of attack. 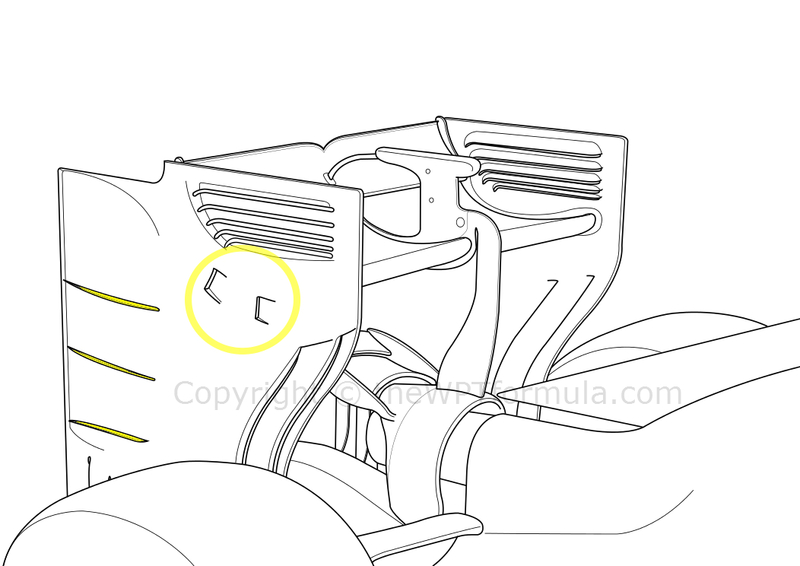 At the back of the endplate, Ferrari have installed three pressure gradient vanes that are quite far spread. Their angle of attack is quite minimal, suggesting that they only want to induce a little more outwash at the rear of the car than they already have. This will help with the air expanding from the diffuser to pull the car downwards. Finally, the top flap is now straight cut excluding a small dip in the middle. This replaces the previously double V-cut upper flap. A minor change but this will again help with the airflow passing upwards and outwards. Also new on the F14 T last weekend was a much revised rear suspension geometry which, to my understanding, will be carried over into 2015. Raikkonen actually ended up running it for qualifying and the race and it is designed to improve traction. The rear wishbones are visibly more aggressively angled towards the ground and the car now sits slightly squatter. Currently scrapping for fifth place in the Constructors’ championship, Force India are keeping up a high rate of development despite having a significantly lower budget than their direct competition, McLaren. New for Texas was a set of rear wing endplates, which follow a similar philosophy to those seen earlier in this post on the Ferrari. The back of the endplate is, unlike the Ferrari, much more heavily undercut than before whilst retaining the six pressure gradient vanes beneath. The endplate louvres (circled) have been totally redesigned with a much cleaner cut into the ‘plate followed by a guide vane for each louvre on the inside face. Sauber also have a very similar design. Having run an arched Y100 winglet above/around the exhaust for some time now, the old specification winglet was in place for the weekend which forms a traditional curved aerofoil flanked by two endplates that attach to the rear crash structure. The new endplates could reduce drag to such an extent that the team can run a higher wing angle, thus reintroducing the old winglet as a way of further improving rear downforce by allowing the exhaust plume to travel more readily to the base of the wing. Tested in free practice on Friday was a rapid prototype steering wheel which included the PCU-8D McLaren Electronics dashboard LCD display. Force India are one of the few remaining teams who use the old-style LED dashboard but with less information passing into the drivers’ earpieces thanks to the FIA, the team clearly feel the need to trial the larger display for next year. The wheel itself looked 3D printed to a certain extent rather than fully carbon fibre. This saves costs whilst giving the drivers a general idea of the direction they are taking into 2015. The trackside engineers will have gathered feedback about the ergonomics of the wheel, including the layout of the buttons and switches, before contemplating any design changes. The team later reverted back to the old wheel for the rest of the weekend. Like Lotus’s nose, we could well see it again before the year is out. After pulling further clear of Force India over the weekend, McLaren have all the more reason to start further ramping up their 2015 developments and backing off on 2014 components. For the US, however, a bulge/pelican chin was added beneath the nose and slightly behind the finger extension to improve the airflow passing downstream and under the floor.